Mark Sayles/GettyHelen Mirren and ‘Phantom Thread’ costume designer Mark Bridges sit on the Jet Ski Bridges won for giving the shortest acceptance speech on Sunday. Oscars acceptance speeches have grown dramatically in length over time, according to a Ceros analysis of the Academy’s speech database. 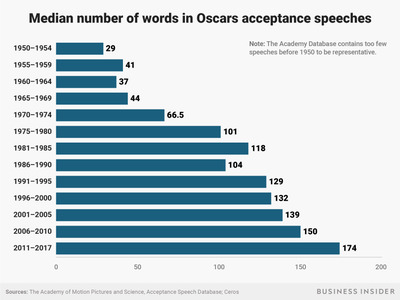 Between 1950 and 1954, the median Oscars acceptance speech consisted of 29 words. From 2011 to 2017, the median speech ran 174 words. The growing length of Oscar speeches was the tongue-in-cheek reason for host Jimmy Kimmel’s decision to award a Jet Ski to the Oscar winner who gave the shortest acceptance speech on Sunday. 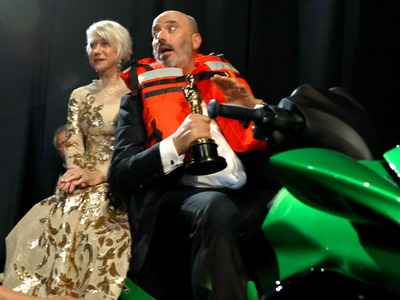 Jimmy Kimmel’s decision to award a Jet Ski for the shortest acceptance speech at Sunday’s Oscars was not only a great comedic bit, but a practical attempt at curbing a historical trend. While Kimmel joked in his opening monologue that he would be timing all Oscars acceptance speeches, which he said have gotten longer over time, data analysis from Ceros shows just how dramatically these speeches have extended since the Oscars’ early days. The company analysed the median word count in all Academy Award acceptance speeches from the Academy’s database, dating back to the 1950s. Between 1950 and 1954, the median acceptance speech consisted of 29 words. From 2011 to 2017, the median speech ran 174 words. On Sunday, Kimmel’s award for the shortest acceptance speech went to the “Phantom Thread” costume designer Mark Bridges, who received a green Jet Ski worth nearly $US18,000. While Bridges’ speech clocked in at a quick 36 seconds, many other Oscar winners skirted their shot at winning the Jet Ski by going long. Gary Oldman, who won the best actor award for his performance as Winston Churchill in “Darkest Hour,” gave an acceptance speech that reached nearly 3 minutes in length. Frances McDormand, who won the best actress award for her performance in “Three Billboards Outside Ebbing, Missouri,” gave a speech that lasted around two minutes and thirty seconds, but it also included a striking, wordless tribute to all of the women who were nominated.